Hope you are enjoying a wonderful season. Christmas will be here soon. This year I placed a skinny tree in the window of my dining room giving more room around the table. It still looks like a full fat tree from the outside with the curtains draped back. I simply tied sheer gold ribbon with greens and berries to each chair. The centerpiece is a lantern filled with vintage ornaments and topped with a red ribbon. I set the lantern in a wreath with timer lights and a table square is angled in the center. All easy to move when needed to dress the table for Christmas dinner. On the hutch I added two smaller round poinsettia doilies like the larger square. given to me last year by a dear friend for Christmas. On each side of the hutch I have hung Christmas stockings in black and gold. The chandy over the table is dressed with lots of crystals, and vintage candle rings in silver tinsel. Greens, berries and gold birds sit in this arrangement along with my favorite cardinal figurine. The white metal pitcher was a special birthday gift from a dear friend filled with flowers. In one corner, I moved this chair from the sitting room to make room for the tree. from Kathy at Creative Home Expressions to the chair and tied on a red ribbon with a center Christmas pin to holiday it up!! After Christmas, I'll remove the ribbon. hand painted in black with off white accents on the doors. I used two pegs for each glass placed close together but open enough to slide a wine glass stem between the pegs for hanging. On the buffet I have one of my favorite cards framed and hand created by Diane of 1CardCreator. with a sweet little mouse full and exhausted from his apple treat! My dear grandmother gave me this sweet candle holder before she passed away. I love it even without a candle. He's taking a little nap after stuffing himself full of an apple. from the hanging candle lamp. To the right before going back into the sitting room, stands this large Santa. He holds his little lighted tree and gift package. and each side is beautifully embroidered with roses. Below is a few ornaments from the skinny tree. special keepsakes, vintage ornaments and large red roses. 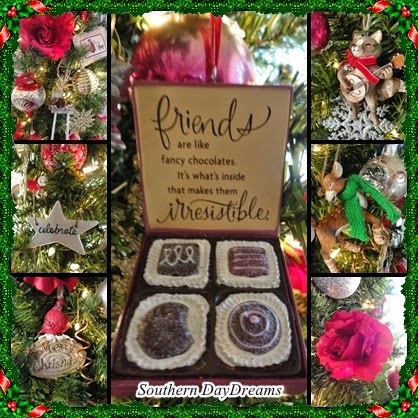 The center box of chocolate ornament was a gift from a dear friend several years ago. Friends are like fancy chocolates. Thank you for stopping by to visit Christmas in my Dining Room. I'll be back with a little kitchen Christmas next time. Have a wonderful December day! I was reading this post thinking of how beautiful your dining room looks, then I came to the picture taken at night, with the Christmas lights glowing and felt as though I was in a Christmas story book. How extraordinary! Good Morning, Celeste. Your dining room looks so festive! My favorite photo is the last one where the lights give the photo a nice glow. Merry Christmas! Celestine, your rooms are so pretty and festive with all your special touches. That candle from your grandmother is so adorable, how sweet! Something you will always challenge! Happy Holidays! It all looks so lovely, and I'm borrowing the chair back decor! Absolutely stunning, Celeste! Your home is beautiful, thanks to all of the special touches that you add. I love the thought you put into the dining room table and having a centerpiece that is easily removed when it is time for the table to be in use. The little skinny tree looks adorable there. I love the candle holder your grandmother gave you. I have a few things my grandmother gave me and they are priceless treasures. Hi Celeste! I enjoyed seeing your dining room decorated for the holidays. Everything looks so pretty. It's been fun seeing what everyone else is up to! Wishing you and your loved ones a happy holiday! You certainly have brought Christmas to life in your home - and it's soooo pretty! I love your night time look in the Dining Room. Celestina, Your attention to detail is stunningly beautiful. Celestina, your home is so beautiful. The photo with all the lights is so inviting. I feel as though it is welcoming me to walk right into the photo. You know that I have always been a huge fan of yours, because you are so amazingly talented. You bless me every time I read your post and you cause me to sin just a little because I sometimes steal your ideas. I really do not think I've seen a more impressively decorated Christmas home. You have spent much time putting all your loving touches and personal treasures into each and every room. You rock! Love the ski's and pole touch. The velvet and faux trimmed standing Santa is really fantastic. I especially like the expression Santa has on his face. Every Christmas detail in your dining room is beautiful!! I really love the dressings on the back of the chairs...I need to remember that for next year. It's all so beautifully put together! Each touch is perfect. I love your buffet with the wine glass storage above. The little touches make it all so cozy and inviting! Aren't the pencil trees great? We have one for our living room and it helps so much since we're in a condo. Great space saver! I can't get all of my ornaments on it but that's okay... makes me be selective and use all my favorites!! The black and gold stockings add such a lovely elegance too. The chair swags are absolutely gorgeous on your chairs Celeste. I've had such a good time touring your din rm... thanks so much for sharing it all with us!! So beautiful Celestina! I love the skinny tree in the window. The white metal pitcher and the rocking chair, perfection! I like how you displayed the wine glasses. I just love it all sweet friend! I’m way behind on my blog reading (and my posts!) after a long weekend away and all the Christmas preparations! I'm enjoying catching up and I can see how busy you have been decorating your home with so many pretty and interesting details. I love to see pine cones and berries as decorations at this time of year. Your red and green throw is so cosy and festive and the quote about friends is just wonderful! Your dining room looks so festive and gorgeous. I' m like Alice in Wonderland now! The big Santa Claus, the marvelous tree, the centerpiece, the wonderful chandy with crystals...everything so fairy and beautiful. It is a lovely Christmas dinning room! The tree is perfect in that room. What a fun time you have been having in preparing all of your Christmas decorations just so beautifully. I just love most of all the little gifts from friends that you have spread around that mean so very much! It all looks so festive and perfect for the Christmas Season. Your dining room looks so pretty and festive, Celstina! I love your chandelier and all of the wonderful crystals, and the santa with his fur coat is so neat! Can't wait to see what you've been up to in the kitchen! your Dining Room looks so pretty! I love the way you decorate everything! So much Love you have put in it! I love the Chair-decorations, what a lovely Idea, and I love the canldholder from your dear Grandmother! Is it wonderful and filled with lovely memories I guess! The saying about friends is great ! Sending you love and hugs and blessings for a wonderful Christmastime! Your dining room looks beautiful! The last photo of your tree in the dark is gorgeous! You have exquisite taste, my dear Celeste! Your dining room is a room full of beauty and charm. Christmas in your dining room is wonderful! Your skinny tree by the window looks lovely. The gold ribbon, greens, and berries tied to each chair adds a special touch. I love the poinsettia table square and the lantern with the red bow. That looks so pretty. The cardinal figure caught my eye, that's sweet. The apple candle holder that your dear Grandmother gave you is a treasure, and you will think of her every year when you put it out. And the large Santa is gorgeous in his velvet coat with roses. You have really made your dining room beautiful and festive, Celestina. I hope you have the merriest Christmas. You are such a dear blog friend to me. Hello Celestina, I love your decorating... its so festive and welcoming. I'd love to come visit you!! I moved last month and most of my stuff is stillin boxes. I'm decorating this weekend before all my guests arrive... so glad you shared your photos!! Everything is so lovely. You have put so much thought and care into making a lovely and welcoming home. Thank you for sharing the beauty with us. There's so much I like, but I'll just mention the framed card and the white vase with the beautiful greenery. Looking forward to seeing the kitchen! I really like how skinny trees can somehow look much larger from the outside. I wonder why that is? Whatever the reason, that was a good idea to put a smaller one in your dining area. I've places ribbons and other pretties on chairs from time to time, and I think it is an easy but oh so effective way to dress them up. I love the gold ribbon on yours! Merry Christmas Celeste! I'm happy to have met you recently, and hope you have a healthy and happy new year! You have a beautiful home! Merry Christmas!